Patrick B. Hughes | Adams Jones Law Firm, P.A. Patrick began his legal career as a research attorney/law clerk for the Kansas Court of Appeals, the Kansas Supreme Court, and the U.S. Court of Appeals for the 10th Circuit. 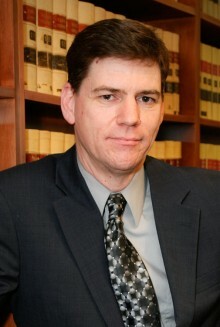 Since joining Adams Jones in 1997 he has continued appellate work, in both state and federal court, and practices in the areas of litigation and dispute avoidance. His practice principally consists of disputes involving real estate, businesses, governmental entities, estates and trusts, and financial institutions, and disputes involving land title, landlords and tenants, liens, inverse condemnation, co-tenants, right-of-way and municipal law. Pat’s real estate related experience includes zoning and subdivision matters, land title disputes and title insurance, water rights, and construction claims. In the business area, in addition to representing clients in business disputes and contract negotiations, he provides legal services related to administrative licensing proceedings and intellectual property - advising and representing clients in matters concerning trade secrets, copyrights, trademarks, and patents. In the area of estates his experience includes will contests, claims against estates, and advising and representing trustees. Represented title insurance company in defending coverage dispute covering mechanic’s liens from failed retail development project. Represented business in litigation to recover embezzled funds from former employees. Assisted business in obtaining zoning approval for property uses not otherwise allowed. Defended bank in challenge to retail banking practice. Law Clerk to Judge Mary Beck Briscoe, Federal Court of Appeals, 10th Circuit, 1996-97. Research attorney for Justice Edward Larson on the Kansas Court of Appeals and Kansas Supreme Court, 1994-96. Best Lawyers In America©, listed in Commercial Litigation, Land Use & Zoning Law and Real Estate Law.